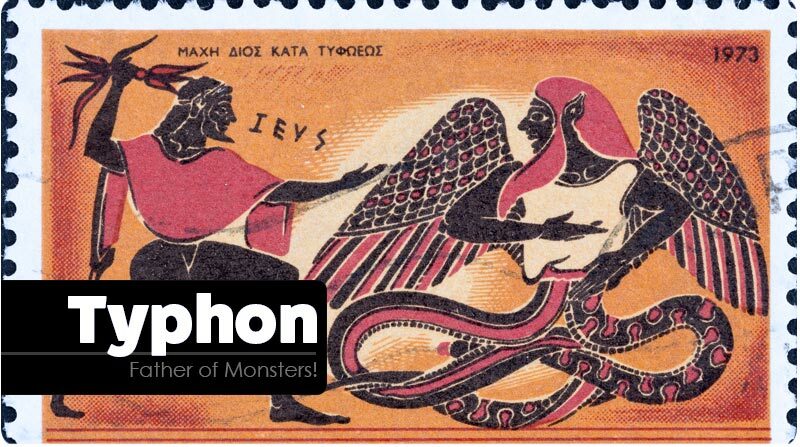 Typhon was a monstrous giant and the most deadly creature in Greek mythology. 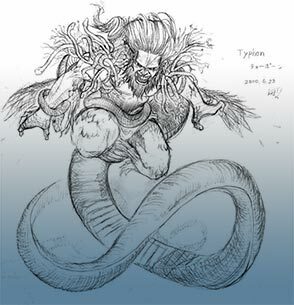 Typhon was the last son of Gaia, and was fathered by Tartarus. Typhon and his mate Echidna were the progenitors of many famous monsters. Strength was with his hands in all that he did and the feet of the strong god were untiring. From his shoulders grew a hundred heads of a snake, a fearful dragon, with dark, flickering tongues, and from under the brows of his eyes in his marvellous heads flashed fire, and fire burned from his heads as he glared. And there were voices in all his dreadful heads which uttered every kind of sound unspeakable; for at one time they made sounds such that the gods understood, but at another, the noise of a bull bellowing aloud in proud ungovernable fury; and at another, the sound of a lion, relentless of heart; and at another, sounds like whelps, wonderful to hear; and again, at another, he would hiss, so that the high mountains re-echoed. In size and strength he surpassed all the offspring of Earth. As far as the thighs he was of human shape and of such prodigious bulk that he out-topped all the mountains, and his head often brushed the stars. One of his hands reached out to the west and the other to the east, and from them projected a hundred dragons’ heads. From the thighs downward he had huge coils of vipers, which when drawn out, reached to his very head and emitted a loud hissing. His body was all winged: unkempt hair streamed on the wind from his head and cheeks; and fire flashed from his eyes. Hyginus (1st century BC), in his list of offspring of Typhon (all by Echidna), retains from the above: Cerberus, the Chimera, the Sphinx, the Hydra and Ladon, and adds “Gorgon” (by which Hyginus means the mother of Medusa, whereas Hesiod’s three Gorgons, of which Medusa was one, were the daughters of Ceto and Phorcys), the Colchian Dragon that guarded the Golden Fleece and Scylla. The Harpies, in Hesiod the daughters of Thaumas and the OceanidElectra, in one source, are said to be the daughters of Typhon. Read more about Typhon on Wikipedia.